This Multi Media Cart is Easy to Manuever! The Rolling Caster Wheels Can Be Locked to Keep Steady While in Use. 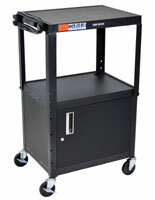 This Multi Media Cart is Great for Classrooms or Offices. Black powder coated finish on a steel construction for a durable and lasting fixture. 4 caster wheels for an easy to move display with two locking to keep stable while in use. 2 shelves that are 32"w x 20"d with a 1/4" retaining lip for ample storage space. 3-outlet surge protector so AV equipment can be plugged in right away. Adjusts in height from 24" to 42" in 2" increments for the ideal stand height. Cable pass through holes to keep unsightly wires hidden. Locking storage cabinet with two doors for keeping equipment secure while not in use. This steel multi media cart, also known as an AV trolley, includes a 3 outlet surge protector to plug in audio visual equipment. This display is great for any classroom presentation. This multi media cart that has a locking cabinet is great for securing av devices while not in use. This steel workstation has a black powder coated finish to fit into nearly any environment. This multi media cart that has two locking wheels allows for a stable surface for presenting, but moves easily when unlocked. This mobile display with a cabinet is a secure storage space for classrooms, churches, offices, and more! This multi media cart for presentations has a 1/4" retaining lip around the shelves to keep items from falling off. Each shelf is 32"w x 20"d to provide plenty of space, This multi media cart is ideal for holding a laptop or a projector while someone is giving a presentation. This presenting stand is simple to roll around a room to keep out of the way of everyday activity. This multi media cart has cable pass through holes to hide unsightly wires. This display is one of many styles offered here. 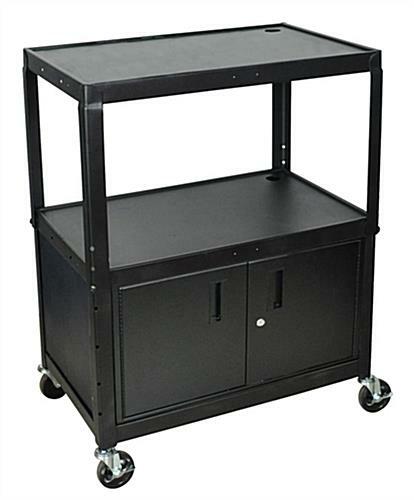 This mobile multi media cart is simple to move around an establishment with 4 rolling wheels. This workstation is constructed of durable steel with a sleek black finish. This mobile workstation, multi media cart that adjusts from 24"-42"h allows users to set it at the ideal presentation height. This AV trolley with locking cabinet and15' UL Listed power cord ships ready to assemble. This workstation has a black finish that suits nearly any environment. This presentation stand can securely store expensive av equipment when not in use in the locking cabinet. Manufacturer model# AVJ42XLC. 32.0" x 14.8" x 20.0"